I wasn't really ready for spending a long time in the sun, so Carol, Emma and I headed off to Oba for our Turkish bath. It was preceded by a 10 minute stint in a sauna "to warm us up". As the sweat poured down our faces, we decided that they should have just left us standing outside for a few minutes. The effect would have been the same! Afterwards we were lying in the relaxation room and the conversation turned to horror stories about spa treatments. 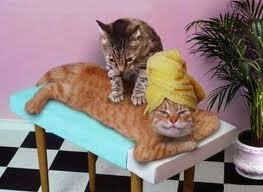 Emma's friend had gotten a gift voucher for a newly opened spa. She was lathered in mud, wrapped in clingfilm and left to relax in a dimly lit room. After a while the lights went out completely and jets of water squirted out at her. "Oh, I must have to wash this off," she said to herself. She scrubbed and scrubbed but all that was happening was it was turning into a gooey mush. It was also starting to sting a bit. She was beginning to feel a bit frustrated, when the door was opened by one of the beauticians. She looked at her client who resembled a monster from the deep at this stage, and let out a scream. "OH MY GOD! Get out," she yelled. It seemed that they hadn't realised that the room was occupied and had turned on the self-cleaning system. She was actually being sprayed by jets of disinfected water!!! My story didn't take place in a spa as such. My friend had never had a massage. She had a male friend who was a little bit alternative. He was into reiki, rune stones and all that jazz. He had started doing a massage course and needed someone to practice on, so he asked my friend. She was a bit sceptical but agreed. She went to his house where he had a "table" prepared for her to lie on. He left the room for her to get ready. Not knowing whet the dress code for massage was, she popped up on the table. He returned, dimmed the lights and put on some panpipe background music. He turned towards her to start the massage. It was then that he uttered the words that no woman EVER wants to hear..
"Ehm. I think you should put your knickers back ON! My poor friend nearly died of embarrassment. After wards he asked her how it went and if she felt relaxed. Relaxed? RELAXED? I feel as if I'm going to snap in two, I'm so tense. I take it that she never went for a massage again. Or at least if she did, she kept her knickers on! After deliberating for a few moments, all three of us decided that it would have been less painful to be in the disinfecting booth. That could have been cured by a bit of cream. the other incident would have taken years of therapy to get over!